Fantastic! My First blogging award! Yay! Thank you Tales From Tedium for nominating me for the Liebster Award. A German award dating back to 2010 (just a babe 🙂 )…specifically awarded to blogs with less than 200 followers. 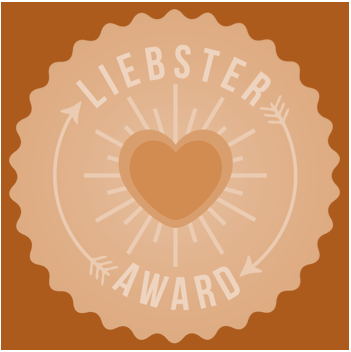 Liebster means ‘dearest’ in German….awww so sweet. I am honored. Baby steps! I can raise each of my eyebrows individually. I am a fan of wine and chocolate. I am writing a Contemporary Young Adult novel. I have mostly brown eyes that occasionally turn green, cause unknown. I like all kinds of olives. I have a bachelor of science in electrical engineering, but now work as a writer. 1. If you had to pick a final meal what would you choose? Wine and chocolate…such a bizarre thought, not sure I’d have an appetite. 2. If you could only have one book of fiction to read forever, which would it be? 3.Where do you most want to visit and why? Changes all the time — today, Jerusalem because a friend just got back from an amazing trip and it sounds great. Engaging in another form of writing and meeting other bloggers. 5. Why did you choose to take part in the A to Z challenge? My blog needed attention and it sounded like a lot of fun (which it has been). 6. Have you preplanned any posts, Q or X or Z perhaps? Nope…but thank you for the idea/reminder! 7. When did you last enjoy live music, who played? New Year’s Eve 2012 on Times Square! Various artists. My family. All decisions are based on what’s good for us all first and foremost. 9. Which three words best describe you? 11. How long did you take to choose you 11 nominations? Not sure, this whole post has taken a good couple of hours. But I learned some formatting things I didn’t know before…so time well spent! To my Liebster Nominees, I have chosen you from Blogging A to Z Challenge 2013 because each day I take time to look at at least 3 blogs and I have been lucky enough to stumble upon your blog and found it interesting and enjoyable. I look forward to getting to know you! 2. What is one major thing you’d like to accomplish this year? 3. What is your biggest obstacle, right now? 4. Why did you choose to take part in the A to Z challenge? 5. Have you preplanned any posts, Q or X or Z perhaps? 6. What is the current buzzword? 7. What word did you overuse today? 8. What song is stuck in your head? 9. What was the last TV show you watched? 10.What is your favorite accessory? 11. Which three words best describe you? I’m sorry, I have already been nominated for the Liebster Award. I will be doing my questionnaire after the A to Z.
I enjoyed reading through all of your comments. Thanks for sharing. Congratulations to the award! And thank you for nominating me, I really appreciate that! I have a few other nominations pending, so I’ll see when I’ll find the time to take action on this one (after the A to Z, I’m afraid…). I look forward to keep following you through the rest of the alphabet, and beyond!